Preheat the oven to 180C (350F), while you prepare the ingredients. In a pan, place the butter, onion and celery. Over low heat, cook until the onion is tender, about 4-5 minutes. Add the garlic, mushroom stems, back rashers, spices and seasoning (if desired) and cook for 2-3 minutes. 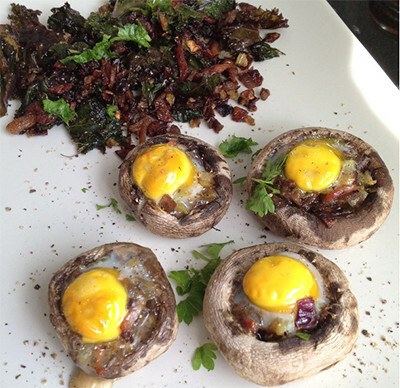 Place the washed and de-stemmed mushrooms in an oven proof dish, with the inside facing up. 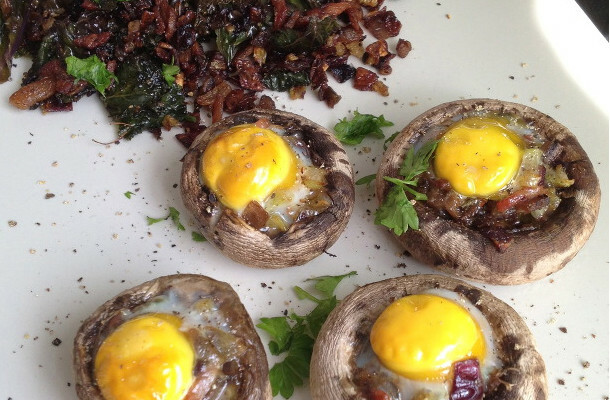 carefully pour one egg on top of each stuffed mushroom. for example and serve as a side to the stuffed mushrooms. Garnish with freshly cut parsley or cilantro, if desired. These also work well as an appetiser for parties.